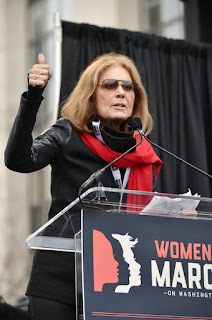 So here's Gloria Steinem last month. She will be 83 in another month. Still part of the political conversation, still a great speaker. Steinem is of course a leader of "second-wave" feminism and an inspiration for all subsequent-wave feminists. Meanwhile my mother, who is two and a half years younger than Steinem, lives in a senior citizen complex in South Jersey and her neighbors, mostly women, are conservatives - not all of them are political but they believe in "traditional values" and most of them oppose not only abortion but other equal rights for women. They seem really old and out of it, years older than Steinem. I do think that Gloria has had work done on her face - her face is much too smooth for someone that age - but that's OK, I am certainly not going to judge her. It's freaking horrible getting old, especially for women in our culture, so I don't hold it against anybody who wants to hold off on looking like 80 for as long as possible - this is what Google comes up with when you type in "80 year old woman. But plenty of women who have had work done are still content to do their old person activities and withdraw from fighting for good causes, but Gloria is marching on, fighting for feminism. I hope I'm like that when I am her age. If I don't decide to go with the Dame Marjorie Chardin plan. Meanwhile, Nora McCorvey, the Roe in Roe v. Wade, who switched sides and became a Christian anti-abortion activist is dead at 69.